Dirty Unicorns Oreo based on Android 8.1 is now available to download for many devices. 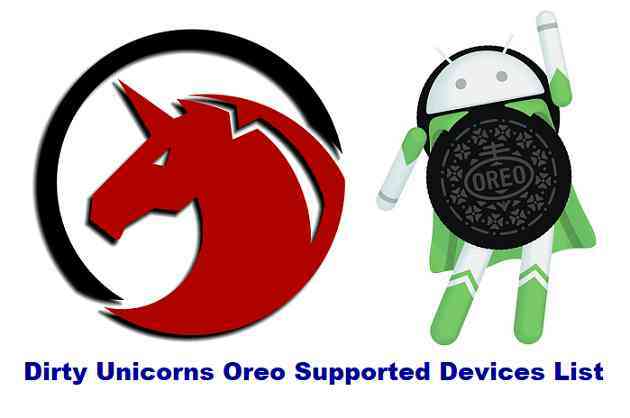 It’s been a couple of quarter and many devices are getting Dirty Unicorns Oreo support now. Here is a list of supported Dirty Unicorns devices available OFFICIALLY and UNOFFICIALLY. Dirty Unicorns is one of the popular ROMs among other custom ROMs such as: LineageOS, OmniROM, Resurrection Remix OS etc. The Dirty Unicorns ROM is based on Android Open Source Project (AOSP) codebase. Dirty Unicorns ROM does not follow similar versioning convention wirth respect to Android version. Dirty Unicorns v12.1 corresponds to Android 8.1 update. To distinguish that, I will simply stick to Dirty Unicorns Oreo and DU Nougat like that. Dirty Unicorns was started in 2012 by Alex Cruz aka Mazda just out curiosity. Today it has a full roster of talented developers with huge support from themers, developers and many folks around the community as well as a few OEMs. As always the Dirty Unicorns Oreo ROM does not come with pre-installed GApps (Google Applications) because of Copyright issues, so, you need an extra Oreo 8.1 GApps to be installed via a custom recovery. Also, this Dirty Unicorns Oreo ROM does not come with built-in ROOT binary, hence you need the supersu ROOT binary to be installed after installing the Dirty Unicorns Android Oreo 8.1 ROM.